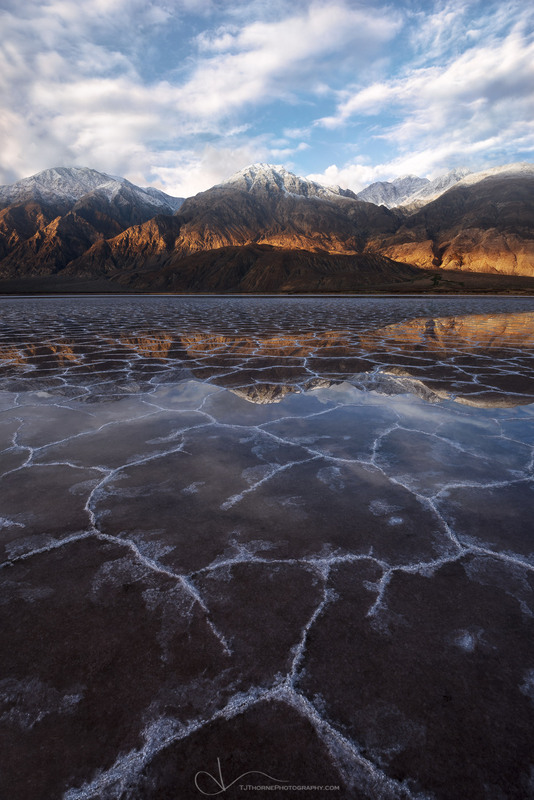 This is a photo of some rare conditions at a remote salt lake in Death Valley National Park, California. Anyone familiar with my work associates me with Oregon and the Pacific Northwest. In my short time focusing on the art of landscape photography, I have not had a lot of opportunity to venture too far from home, and when I do, it usually requires something akin to every star and planet in the universe aligning. I have had a very strong urge to shoot something DIFFERENT, not just for my portfolio... but also for my heart and mind. While I absolutely love Oregon and all of the diversity it offers... I needed to see different things. I needed a challenge. I needed a photography trip with a couple of my best friends. So leave it to Ted Gore and Erin Babnik to convince me of giving the herculean effort of sneaking away for a week a whirl. As luck would have it, everything fell into place and weeks later we found ourselves here. I have to say.. I hadn't felt that great in as long as I could remember. Maybe it was finally getting away from the race of life, maybe it was the whole sleeping in a tent in the middle of nowhere under the stars thing, maybe it was because I was eating healthier and laughing constantly, maybe it was poking fun at each other while we froze our asses off in the dark and sweat our asses off during the day, or maybe it was just.. all of it. Every. Single. Thing. Yes.. even the naked hippies, the high winds blowing sand through my tent and into my face all night long (a great exfoliant, by the way), the empty handed scouts, the mudfest, and the whole 'getting stranded in the middle of the desert with two flat tires' thing were moments that I cherished and will never forget. I'm glad that this image is the one that marks my first out of Oregon. Just looking at this shot takes me back to so many aspects of that trip.